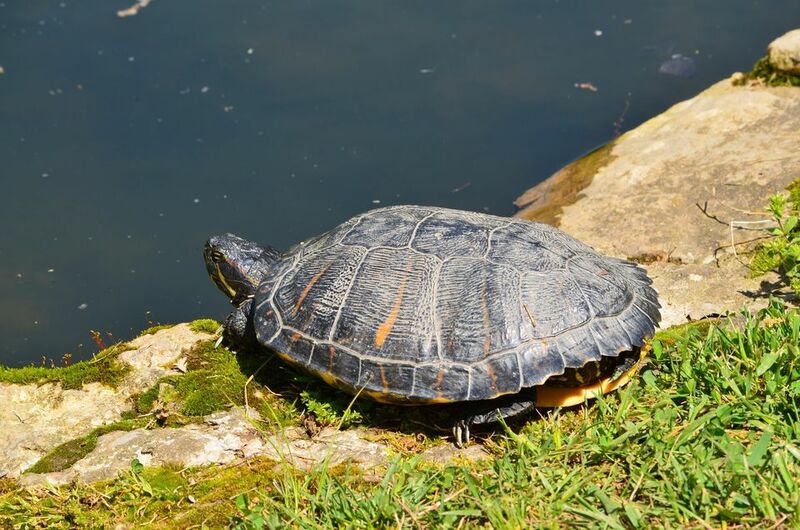 Encouraging red-eared sliders to bask is important to their health. They should be getting out of the water and drying off on a regular basis. If your turtle is not doing this, you need to look at your tank set up to make sure basking is inviting to your slider. Red-eared sliders need to bask for a number of reasons and it serves many purposes (besides feeling good). Basking essentially means drying out and absorbing the UV rays of the sun. It's something the turtles do in their natural habitat every day (conditions permitting) and need to do in captivity. Make sure you have provided appropriate basking areas as well as a good temperature differential to entice your red-eared slider to bask. Ideal temperatures of the water in the tank should be 75 to 78 degrees Fahrenheit for adults and 78 to 80 degrees Fahrenheit for hatchlings. The basking spot should be considerably warmer at 90 to 95 degrees Fahrenheit. If the temperatures (water or basking) are too low, turtles will be sluggish and may not bask. The difference in temperature between the water and the basking spot is also very important and it's that differential that entices them to bask. If the water is much warmer than recommended or the ambient air temperature is too cool, the turtles will be unlikely to get out of the water to bask. Basking is essential for the turtle's health. It allows the turtle to completely dry out and warm up. This makes it more difficult for fungal infections to develop because fungus needs moisture to grow. These type of infections are common health conditions for red-eared sliders. It's also a natural behavior that they are born with. If they live in an environment where they cannot bask, they will likely get stressed, which can cause a number of other health conditions. The turtle needs to get out of the water and onto the basking spot easily enough; this is especially crucial with hatchlings. To create the basking area within the tank, use a UV light and then create an easily accessible sloped area where the turtle can climb out of the water to bask. The goal is to create a spot that is partially submerged or has a ramp to allow the turtle to climb out of the water. This spot should be about 10 degrees Fahrenheit warmer than water temperatures to entice basking. Be careful, though: An area that is too hot won't promote basking and may even put the turtle at risk of hyperthermia. Offering food before turtles bask will let them digest more easily and could be a treat to encourage basking. Red-eared sliders don't like to be bothered when they're basking. If you interrupt them, they might become startled or begin begging for food. Consider covering the sides of the tank to encourage basking. Place the light over the basking area so the turtle can take full advantage of this important light. Glass blocks UV rays and water filters UV rays. Position the light out of reach and not so close that it can burn your turtles, especially if you have a few turtles that stack on top of each other to get closer to the light. Make sure that the bulb can't get wet if the turtle's splash; the bulb can shatter when wet, posing a hazard. Do not treat homemade platforms with any chemicals and don't allow the metal to rust. Even platforms that are natural or organic can alter the water. The basking platform should be secure and not be prone to dismantling. Make sure your turtle can't wedge itself between the basking area and the tank walls or use the spot to escape. Double check the temperatures of both the water and the basking area and try to set up privacy screens and or rearrange the tank set up. With a new look and feel to their tank, you may solve a problem you didn't know existed. If your red-eared slider is still not basking, it may be time to speak with the vet.